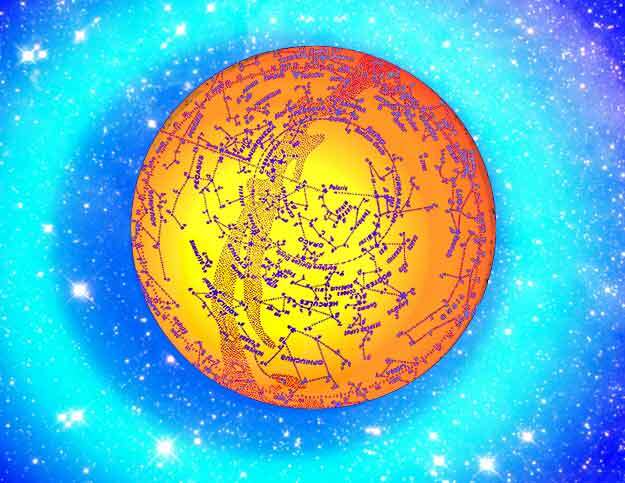 The entire zodiac can be approached and understood from the angle of light. This light is the inner light, soul light, and its unfolding and increasing radiance is the manifestation of our divine nature. Our dedication to this continuous "growth of light in light" provides Humanity with the revelations necessary for us to evolve to our divine destiny. A study of the ideas that follow will reveal the symbolic story of the growth of the light body, within the Soul of Humanity (the Macrocosm) and within each of us (the Microcosm), and will finally make clear the very purpose of God. 1. Aries. — The Light of Life Itself. This is the dim point of light found at the centre of the cycle of manifestation, faint and flickering. It is the "searchlight of the Logos, seeking that which can be used" for divine expression. 2. Taurus. — The penetrating Light of the Path. This is a beam of light, streaming forth from the point in Aries, and revealing the area of light control. 3. Gemini. — The Light of Interplay. This is a line of light beams, revealing that which opposes or the basic duality of manifestation, the relationship of spirit and of form. It is the conscious light of that relationship. 4. Cancer. — The Light within the form. This is the diffused light of substance itself, the "dark light" of matter, referred to in The Secret Doctrine. It is the light awaiting the stimulation coming from the soul light. 5. Leo. — The Light of the Soul. A reflected point of light logoic, or divine. The light diffused in Cancer focuses and reveals eventually a point. 6. Virgo. — The blended dual Light. Two lights are seen — bright and strong, the light of form; one faint and dim, the light of God. This light is distinguished by a waxing of one and the waning of the other. It differs from the light in Gemini. 7. Libra. — The Light that moves to rest. This is the light that oscillates until a point of balance is achieved. It is the light which is distinguished by a moving up and down. 8. Scorpio. — The Light of Day. This is the place where three lights meet — the light of form, the light of soul, and the light of life. They meet; they blend; they rise. 9. Sagittarius. — A beam of directed, focused Light. In this the point of light becomes the beam, revealing a greater light ahead and illumining the way to the centre of the light. 10. Capricorn. — The Light of Initiation. This is the light which clears the way to the mountain top, and produces transfiguration, thus revealing the rising sun. 11. Aquarius. — The Light that shines on Earth, across the sea. This is the light which ever shines within the dark and cleansing with its healing rays that which must be purified until the dark has gone. 12. Pisces. — The Light of the World. This is the light, revealing the light of life itself. It ends for ever the darkness of matter. descriptions of the 12 Zodiacal Lights are directly quoted.